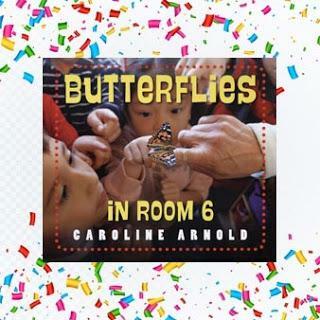 Join award-winning local author Caroline Arnold for an introduction to her entertaining and informative new book, Butterflies in Room 6: See How They Grow. Kindergarteners raise butterflies from egg to adult in this close-up look at the insect life cycle. Follow a classroom of real kindergartners as they participate in a popular activity: raising butterflies. Astonishing photographs show the life cycle of the painted lady butterfly, from egg to caterpillar to chrysalis to adult. Painted Lady Butterfly coloring fun will follow Caroline’s presentation. Butterflies in Room 6: See How They Grow $16.99 To preorder your book, go to http://www.childrensbookworld.com/author-events/ , scroll down and click on the order online link.